If you love music and are headed to Europe this year, you are in luck - a hot new can’t miss show just opened in London’s West End, which vies with Broadway as the world’s premier theater destination. Musicals have long been popular staples of the world’s top theater destinations, and remain red hot today - just try to get a ticket to Hamilton in any of the several cities the Broadway hit is currently performing in. But in recent years a distinctive niche form of musicals emerged, based on the popular music of a particular band or performer. Mamma Mia! kicked off the trend in spectacularly popular (and profitable) style when it opened in London in 1999. It is still there, the eighth longest running play in the city’s rich stage history. It also ran on Broadway for 14 years and in around 50 other countries - it’s estimated that more than 60 million people have seen it. A star-studded movie version was also a big hit, and a Hollywood sequel is about to be released. That’s a success by even the loftiest theatrical definition, so of course, others soon followed suit - Mamma Mia!, based on the music of Abba, led to We Will Rock You (Queen), Movin Out (Billy Joel), All Shook Up (Elvis), American Idiot (Green Day) and others (with more in various stages of production). 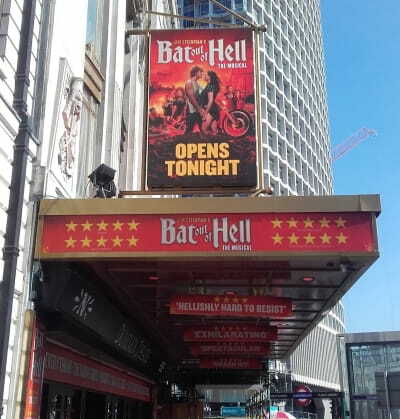 So at first glance, Bat Out of Hell the Musical, an instant hit in London based on the music of Meat Loaf, seems like another twist on the Mamma Mia! model, and that’s what I thought when I got tickets to see it on a recent visit. But it turns out that this is the exact opposite case: Jim Steinman originally wrote the Bat of Hell songs expressly for the theater, with an intense and operatic Wagnerian vision of a romance story loosely based on Peter Pan updated to the modern era. When that didn’t immediately work out, his songs were instead recorded by Michael Lee Aday, better known as Meat Loaf, who he had met earlier through off-Broadway work. Following the immense commercial success of the album and a couple of follow ups, Steinman was able to finally realize his original vision and bring it to the stage. In fact, both Meat Loaf and David Sonenberg, Steinman’s original lawyer and financial backer for the album’s first demo recordings, are producers of the spectacle. To the many Meat Loaf fans out there - the original Bat Out of Hell album spent more than nine years on the charts and sold 50 million copies - this backstory hardly matters, since the beloved hits are all here (Bat Out of Hell, Paradise by the Dashboard Light, Two Out of Three Ain’t Bad, All Revved Up With No Place To Go, Heaven Can Wait, etc.). But it does explain a few things, and while watching the show you realize that the songs were written with an actual plot in mind, unlike the Mamma Mia! pieces which were later shoehorned, albeit very successfully, into a plot unrelated to any original Abba vision. It also explains why so many of the songs are unusually long and theatrical to begin with, and further impresses just how remarkably successful the album was considering the songs were not cut from what was then considered commercial cloth. Steinman also wrote a couple of original new pieces and used works from other Meat Loaf albums to round out the plotline, which I won’t give away, but remains true to his original vision. The show was thoroughly entertaining, and odds are that any Meat Loaf fan will love it, but you do not have to be a Meat Loaf fan to enjoy, since in addition to the already proven hit songs, the visual effects and production are astounding. The motorcycle and car effects are like nothing I have ever seen in live theater, and the use of video is uniquely ingenious. As a result, the show won the audience award for Best Musical of 2017 in London, while several UK critics applauded the epic scale of the choreography and one opined that “this show has literally changed the way musicals are staged forever.” In its recent London return, it has received the most nominations for a musical in the 2018 WhatsOnStage Awards, with eight. Bat Out Of Hell the Musical is slightly easier than Hamilton to get tickets to, but tougher in the sense that it is only in one place at a time. The play debuted in early 2017 in Manchester, where its success led to a short stint in London. It moved onto Toronto next, and has since returned to the Dominion Theatre in London, where the recently launched current run, scheduled to end in late July, was extended until October 27 due to popular demand. That means any travelers headed to London (the top overseas destination for US travelers) through the peak spring, summer and fall season are in luck, with a chance to catch this high energy entertainment spectacle. If you miss it, the show is next on to Oberhausen, Germany in late fall, and if my experience and the audience reaction are any indication, I’m guessing it will keep moving on after that.